474 9/4/1873 Akin, A. J. 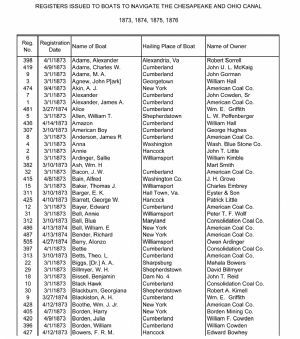 New York American Coal Co.
1 3/1/1873 Alexander, James A. Cumberland American Coal Co.
8 3/1/1873 Anderson, James R Cumberland American Coal Co.
4 3/1/1873 Anna Washington Wash. Blue Stone Co.
32 3/1/1873 Bacon, J. W. Cumberland American Coal Co.
12 3/1/1873 Bayer, Edward Cumberland American Coal Co.
312 3/10/1873 Bell, Blue Maryland Consolidation Coal Co.
486 4/13/1874 Bell, William. E New York American Coal Co.
487 4/13/1874 Bender, Richard New York American Coal Co.
397 4/1/1873 Bettie Cumberland Consolidation Coal Co.
313 3/10/1873 Betts, Theo. L. Cumberland American Coal Co.
10 3/1/1873 Black Hawk Cumberland Consolidation Coal Co.
428 4/12/1873 Boothe, Wm. J. Jr. New York American Coal Co.
405 4/7/1873 Borden, Harry New York Borden Mining Co.